Crumar Mojo XT is the state of the art in digital tonewheel simulation! 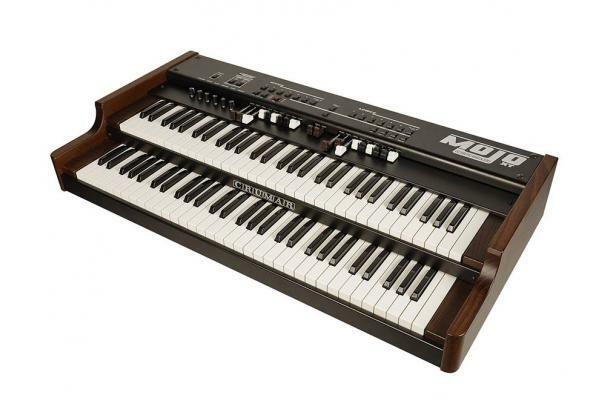 Crumar raises its standards with the release of the MOJO, a compact, portable, lightweight, elegant, easy to use and affordable dual manual tonewheel organ simulation which offers the best simulated organ sound available on the market today at the best price with the best performance ever! MOJO is powered by GSi VB3 Version II. The control panel is clear and easy to understand, which summarizes in few commands what a vintage tonewheel organ offers on a wider interface. You have here one set of 9 drawbars per each manual plus the two drawbars for the pedalboard tones, the classic four buttons for the percussion effect, the three buttons for the Vibrato/Chorus effect and seven preset buttons per each manual. Every control is at its own place, where a skilled organist expects them to be, and there's more: real time controls for detalis such as the key click volume, the overdrive effect, the reverb amount and a small eq. And there's more and more: under the hood you have a whole control center that lets you customize your organ sound like no other digital simulation has ever done before! You have a choice of 20 different virtual generators which reflect the scalings of actual vintage organs, each with its own character, and if that's not enough yet, you can create your own generator. Plus, you can set many more parameters, such as percussion volume and length, key click length, rotary effect equalization, ambience, and much more. Want more? There's more! At the push of a button you can have additional sounds such as two of the most famous transistor organs of the beat age, and two of the most sought after electric piano sounds of all times. MOJO offers versatility, realism, a huge warm and natural sound and... a lot of fun! Feel free to choose how you prefer to control the rotary effect, via the on board switches, via the classic half moon three position switch or a foot pedal. Plug a standard sustain pedal and play internal and external piano sounds with velocity control. Connect it to your computer via the USB cable to use it as a controller. Connect it to other MIDI equipment and use it as a dual keyboard controller with velocity. "We’ve been talking facts and features, but let’s switch brain hemispheres. Vintage tonewheel organs have soul and personality. They breathe. They inspire musical risks in a way that can feel like the organ is playing you. The Mojo gets so close to this ideal visceral experience that it’s downright spooky. In the realm of two manuals you can carry under one arm, though, about the only thing missing from the Mojo is that smell of old dust on hot vacuum tubes." - 6 Selectable presets per manual (plus 2 drawbars selection buttons). - Shift/programming button that allows to enter advanced features: transpose, organ models selection, rotary simulation on-off, vertical simulation on-off, percussion volume, crosstalk level, reverb length, etc.